cDepartment of Diagnostic and Interventional Radiology and Neuroradiology (M.L.H. ), University Hospital Essen, Essen, Germany. SUMMARY: Are subdural hygromas the result of abusive head trauma? CT and MR imaging represent important tools for the diagnosis of abusive head trauma in living infants. In addition, in-depth understanding of the pathogenesis of subdural hygromas is increasingly required by neuroradiologists, pediatricians, and forensic physicians. Therefore, the current knowledge on subdural hygromas is summarized and forensic conclusions are drawn. The most important diagnostic pitfalls, benign enlargement of the subarachnoid space, and chronic subdural hematoma, are discussed in detail. Illustrative cases from forensic practice are presented. Literature analysis indicates that subdural hygromas can occur immediately or be delayed. If other infrequent reasons can be excluded, the presence of subdural hygromas strongly suggests a posttraumatic state and should prompt the physician to search for other signs of abuse. To differentiate subdural hygromas from other pathologies, additional MR imaging of the infant's head is indispensable after initial CT scan. The diagnosis and dating of AHT in living infants predominantly relies on neuroimaging by means of CT and/or MR imaging.23⇓⇓⇓⇓⇓⇓–30 An important indicator for AHT is the presence of SDHs attributed to defects of the bridging veins (BVs). Moreover, in some cases suspected for AHT, radiologists are confronted with almost homogeneous fluid collections within the subdural space, which appear isodense/isointense or nearly isodense/isointense to CSF. These collections are then interchangeably termed as subdural hygromas (SDHys), chronic subdural hematomas (cSDHs), or a terminologic mixture of both: chronic hygromas. This radiologic diagnosis has often resulted in difficulties with regard to the medicolegal assessment of such cases because the exact pathogenesis, diagnosis, and significance of SDHys are still a matter of debate and uncertainty, particularly in infants.31,32 However, these issues can be decisive in court, for example, when SDHys are considered as evidence for the age of injury. What are the current theories regarding the pathogenesis of SDHy? Which alternative explanations and differential diagnoses have to be considered? What forensic implications arise concerning AHT? Pathology is always based on anatomy. Under physiologic conditions, the subdural space does not exist in humans. It does not open until the dura-arachnoid interface is mechanically separated, for instance due to brain shrinking, trauma, or neurosurgical interventions.33⇓–35 This opening is actually regarded as a cleaving of the so-called dural border cell layer—the innermost zone of the dura mater—and therefore also referred to as intradural lesion.33,36 Nevertheless, in this article, the traditional term subdural is used to describe accordant pathologies within that space such as SDHy. SDHys can be regarded and examined from 2 different points of view: first, the traditional perspective of the neuropathologist, forensic pathologist, or neurosurgeon who directly investigate or treat colorful 3D pathologies in the human head; and second, the perspective of the neuroradiologist who indirectly evaluates and interprets 2D black-and-white cross-sectional images from CT, MR imaging, or sonography. Cystic and often multichambered formations encapsulated by a membrane. “Free” fluid collections without any capsule. In radiology, the definition of SDHy is more difficult, and the terminology is very heterogeneous. 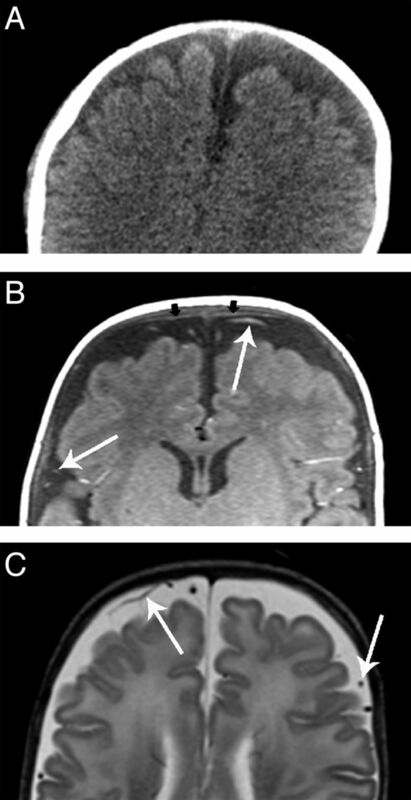 While acute SDH, representing 1 of the leading indicators for Shaken Baby syndrome, can be reliably diagnosed by means of CT and MR imaging, other pathologic fluid collections are often termed interchangeably as SDHys, cSDHs, subdural effusions, chronic hygromas, or simply subdural collections. But what about SDHy versus cSDH? A current neuroradiologic textbook by Osborn55 defines SDHys as “hypodense, CSF-like, crescentic extraaxial collections that consists purely of CSF, have no blood products, lack encapsulating membranes, and show no enhancement following contrast administration” (Fig 1). This description is strikingly similar to the second morphologic type of SDHy suggested above by Unterharnscheidt.37 However, this CSF-like appearance is also the reason why SDHys harbor a high potential to be confused with cSDHs.57 According to Osborn,55 cSDHs may be defined as “encapsulated collections of sanguineous or serosanguineous fluid confined within the subdural space.” This description, on the other hand, closely resembles the first of Unterharnscheidt's37 morphologic types of SDHy suggesting that cSDHs diagnosed by radiologists can also be termed as SDHys. In fact, the terms cSDH (in the meaning of old SDH) and SDHy are frequently used as synonyms in radiologic reports as well as in recent scientific literature.34 Thereby, it is implied that SDHys solely indicate remnants of SDHs. Two-month-old boy with huge hypodense, CSF-like, subdural collections lacking encapsulating membranes (A, cranial CT). MR imaging confirmed the diagnosis of frontoparietal SDHys on both sides (B, axial T2-weighted image; C, coronal T2-weighted image). But is this simplification true? This may become an important issue for the forensic expert in court. Once the radiologic diagnosis of SDHy is made, the forensic expert will likely be confronted with 2 questions: Does the SDHy represent a result of AHT? And if yes, does it indicate recent injury, old injury, or, when in combination with other types of subdural collections, the presence of multiple injuries that occurred at different times? Therefore, it is important to understand how SDHys develop or what they originate from. Hereafter, the 2 current basic concepts of SDHy formation with their different medicolegal implications, as well as important alternative explanations, are presented. It appears to be widely presumed that SDHys represent liquefied and/or deposited remnants of a previous acute SDH52,62⇓⇓–65,82 suggesting that, in a case of suspected child abuse, the baby could have been abused weeks ago. In 1857, Rudolph Virchow considered SDHys as “final stages of subdural hemorrhages.”37 But are SDHys really direct remnants of acute SDHs? An advanced approach was developed considering additional aspects of SDHy formation. The suggested process describes the conversion of acute SDH into cSDH via SDHy as an intermediate stage (blue pathway in Fig 2).47,66 Because most acute SDHs resolve rapidly, reflecting the high levels of tissue thromboplastin in brain tissue and CSF,67 this approach has been refined by other authors. During the dissolving of the acute SDH, especially if decreased intracranial pressure is present, the cleaved dura-arachnoid interface is assumed to remain as persistent posttraumatic space. Liquid remnants of the acute SDH or CSF might then pass into that opened space by effusion from surrounding vessels or even the subarachnoid space, forming the SDHy.50,52 It should be noticed that in this approach, the SDHy is considered as a consequence of the SDH but not as a directly transformed remnant of it. Simplified schematic drawing of the pathogenetic pathways of the origin and fate of SDHys. ICP indicates intracranial pressure. Alternatively, Mack et al36 suggested that CSF could physiologically move from the subarachnoid space into interstitial spaces of the dura mater and subsequently via the dural venous plexus into the dural sinuses. CSF might therefore be present in small amounts in the dura at all times. 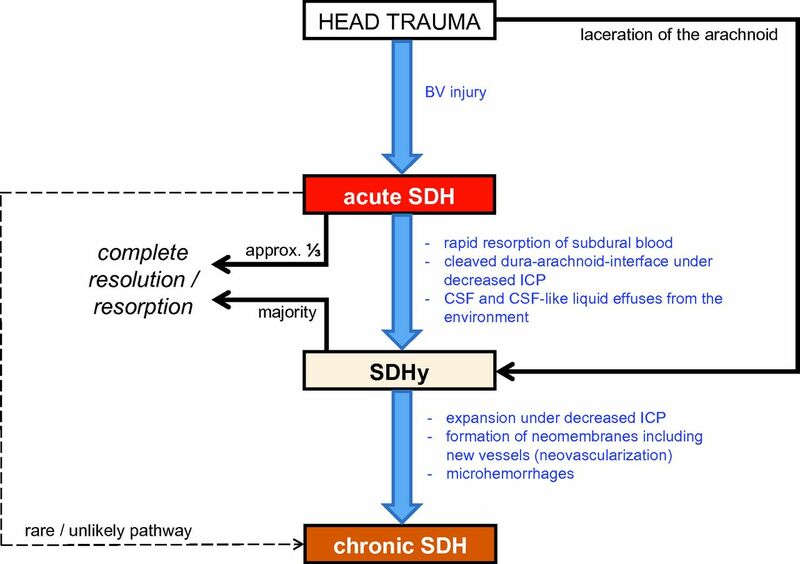 In any cases of alteration of this CSF absorption pathway—for instance from bleeding into the dural layers—a disruption of the transport mechanism may result in delayed accumulation of CSF within the subdural space producing imaging findings of SDHy. Approximately 30 years earlier, it was hypothesized that concurrent traumatic subarachnoid hemorrhages, that are frequently found together with SDHy, may secondarily predispose to defective CSF resorption leading to enlargement of subdural CSF collections as well.43,68,69 In the end, SDHys represent a subsequent result of acute SDHs. Following the concept of delayed SDHy formation, the presence of SDHy may be medicolegally interpreted as later consequence of AHT that occurred some days or a few weeks before. In regard to a 74-year-old woman with acute SDHy and subarachnoid hemorrhage after accidental head injury, Kamezaki et al73 discussed a tear of the arachnoid membrane as possible reason for the SDHy. Radiotracer and cisternography studies performed in infants with SDHy were able to show that radioisotopes (eg, indium-111) injected into the subarachnoid space move into the subdural compartment.44,53 In addition, the CSF-specific β-trace protein and other proteins have been found up to 100% of SDHys,74,75 indicating that there really is CSF in the subdural space. This is not only a plausible explanation for the known mixed-density appearance of subdural collections frequently seen in AHT cases. The injured arachnoid granulations also explain the often-described occurrence of enlarged subarachnoid spaces because of suboptimal CSF absorption. Following this concept of rapid formation, SDHys must not be considered automatically as direct remnants or delayed consequence of acute SDHs but SDHy and acute SDH may develop simultaneously as exemplified in Figure 3. Medicolegal expert opinions should therefore consider the possibility of an rapid formation of SDHy as an additional symptom indicating AHT. MR imaging scan of a 5-month-old female infant who showed a sudden increase of head circumference (from 50th to 97th percentile within 1 month). Frontoparietal SDHys (maximum width of 11 mm) as well as enlarged subarachnoid spaces (maximum width of 4 mm) were found on both sides (A, sagittal T1-weighted image; B, axial T2-weighted image; thin arrows indicate position of the subarachnoid membrane). In addition, a small subacute SDH was diagnosed in the left posterior cranial fossa beneath the tentorium cerebelli (A, small thick arrows indicate subdural blood). In the preceding months, periodic sonography scans of the head did not ever show any abnormalities with respect to the subdural or subarachnoidal space. Ophthalmologic examination revealed sub- and epiretinal hemorrhages distributed over the whole fundus area of both eyes. These retinal hemorrhages were not present yet in a check-up examination 1 month after birth. As further clinical diagnostics have ruled out coagulopathies, neoplastic diseases, and metabolic disorders, the presence of SDH and retinal hemorrhage prove substantial (sub)acute head trauma and therefore strongly suggest child abuse (AHT). The enlarged subarachnoid spaces, found after the trauma diagnosis, have rather to be regarded as consequence and not as source (see “BESS” section). Hence, the SDHy in this well-documented case can be regarded as a result of acute injury. 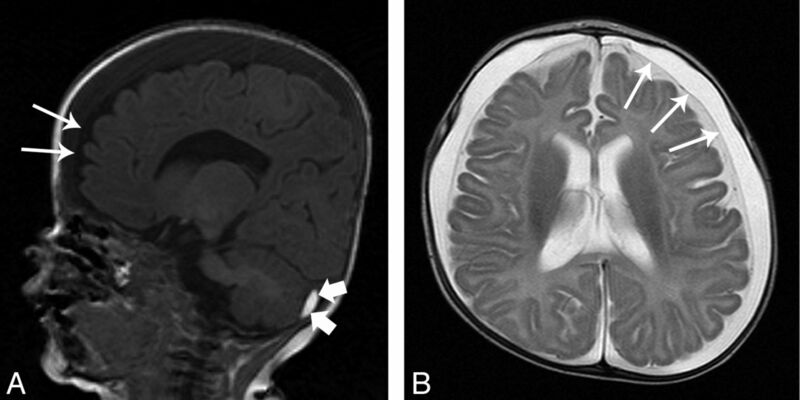 Rupture of pre-existing arachnoid cysts: arachnoid cysts are congenital or acquired intra-arachnoidal CSF collections occurring infrequently. These may rupture because of minor, but identifiable, head trauma, or sudden temporary rise in intracranial pressure.48,81 Ruptures result in SDHys rather than in SDHs.48 However, this phenomenon has not been described in infants yet. A review of the literature by Gelabert-González et al81 demonstrated ages of occurrence ranging from 5 to 25 years. It seems conceivable that arachnoid cysts also rupture in infants and are not yet acknowledged as such. However, as long as scientific data do not support this possibility, this remains mere speculation. Surgeons and pathologists know cSDH as subdural liquid with a dark brown “crank case oil” appearance.47 Many cSDHs also contain a mixture of both CSF and blood, such as breakdown products of hemoglobin or other proteins.55,82 Furthermore, multiple hemorrhages of different ages are supposed to be common (so-called mixed-age SDH).55 This may sometimes also lead to an attenuation approximating that of CSF. The pathogenesis of cSDH is not yet clear. cSDHs were observed to evolve directly from acute SDHs in only very few cases (reviewed in52). Moreover, experimental studies failed to reproduce cSDH from acute subdural blood.83,84 It has also been reported that, based on histopathology85 and CT,66 chronic and acute SDH should actually be regarded as different entities. cSDH might therefore not be (at least not directly) the last stage of an old acute SDH. These pathogenetic considerations show why it is important for the forensic expert to differentiate between cSDH and SDHy. While cSDHs appear to be very rare and delayed consequences of subdural collections, SDHys can apparently develop delayed or rapidly. However, differentiation can be impossible for the radiologist in cases of cSDH appearing CSF-like in CT or MR imaging. These cSDHs are particularly vulnerable to be accidentally referred to as SDHys. Consequently, the terms cSDH and SDHy are often used as synonyms in practice. Some authors describe the differences between cSDH and SDHy as follows: SDHys are thought to be less than 3 weeks old, static or decreasing, and do not or rarely produce a mass effect, whereas cSDHs are thought to be older than 3 weeks, enlarging, and may cause a mass effect.50,51,88 However, all these smooth differencing criteria should be handled with care. “Three weeks” cannot be a strict borderline, and most of the aforementioned pathophysiologic data regarding cSDH rely on studies in adults. Thus, it remains at least questionable whether these results can be applied to infants at all. As SDHys mostly lack neomembranes, this aspect could be another morphologic criterion for differentiation. Neomembranes are usually present in cSDHs and encapsulate the subdural collection as a result of tissue response and may even subdivide it into different chambers.34,50,55 Although neomembranes are described as becoming visible to the naked eye after approximately 10 days34 and were shown to aid in dating injuries,89 diagnosing such membranes in CT or MR imaging can be very challenging. Benign Enlargement of the Subarachnoid Space. The benign enlargement of the subarachnoid space (BESS) represents an important differential diagnosis for both SDHy and cSDH (Fig 4).48,51,52,90 These subarachnoid fluid collections are frequently observed and often termed confusingly as “benign hygromas of infancy.” BESS probably results from immaturity of the arachnoid villi leading to a transient form of communicating or external hydrocephalus.52 Infants concerned are usually neurologically uneventful without evidence of prior brain injury.91 Nowadays, BESS can clearly be distinguished from SDHy (Fig 5), particularly because of improvements in MR imaging technology. In the presence of BESS, the vessels, which run through the subarachnoid space, are localized away from the brain. On the other hand, in the presence of a subdural fluid collection, the vessels can be found near the surface of the brain. Benign enlargement of the subarachnoid space. While in CT (A), BESS could be misdiagnosed as SDHy, MR imaging (B, T1-weighted image; C, T2-weighted image) clearly demonstrates the presence of BESS. Note the vessels (thin arrows) spanning through the subarachnoid space. The small black arrows in B point at the subarachnoid membrane. Schematic drawing of the right parietal region as seen in the coronal view imaging. Note the position of the subarachnoid membrane and the subarachnoid vessels (both in yellow). The dura mater is presented in green. A, normal situation; B, enlarged subarachnoid spaces and C, subdural hygroma. SDHy and cSDH are often difficult to distinguish from each other and are often used synonymously in daily case work. While cSDHs in infants are rare and rather implicate a delayed and nonacute process, SDHys may develop rapidly or be delayed. Accordingly, early hypodensity in infantile SDH has also been observed by others51,98⇓–100 arguing against an overhasty diagnosis of a chronic process but suggesting a significant role of CSF. On one hand, SDHys are classically considered as remains of a previous SDH, directly or indirectly, which strongly suggests a trauma of cortical BVs and a delayed formation of SDHys (see Concept 1 section). On the other hand, acute pathogenesis of SDHys has been verified by traumatically induced tears in the arachnoid membrane (see Concept 2 section). In all probability, multiple mechanisms exist and also coexist. Accordingly, it is not adequate to state different ages of injuries when SDH and SDHy are present concomitantly. Both concepts presented have 1 thing in common: if other infrequent reasons and differential diagnoses have been excluded, the presence of SDHy strongly suggests trauma, or more precisely: a posttraumatic state. The presence of SDHy in infants therefore represents compelling reason to search for other signs of AHT such as retinal hemorrhages, fractures, bruises, or inadequate explanations for trauma. To conclude, evaluation of SDHy cases should ideally be done in close cooperation between neuroradiology, pediatrics, and forensic medicine. The initial neuroradiologic evaluation is of particular importance and indispensable for correct medicolegal conclusions.
. Subdural hemorrhage and abusive head trauma: challenges and controversies. Paper presented at: 98th Scientific Assembly and Annual Meeting of the Radiological Society of North America (RSNA), November 25–30, 2012; McCormick Place, Chicago, Illinois.